The paving of streets with macadam, blocks or bricks represented a vital development in the modernization of cities beginning in the nineteenth century. It also represented the product of extensive and often highly skilled human labor. Images of anonymous work crews installing pavement frequently appeared in the pages of municipal reports, underscoring a city’s commitment to invest in such labor-intensive and costly public works. Occasionally the labor involved in street paving generated surprising public acclaim for individual craftsmen, most notably James Garfield “Indian Jim” Brown, whose skill and efficiency defied belief. But making street pavement successful went well beyond its installation. 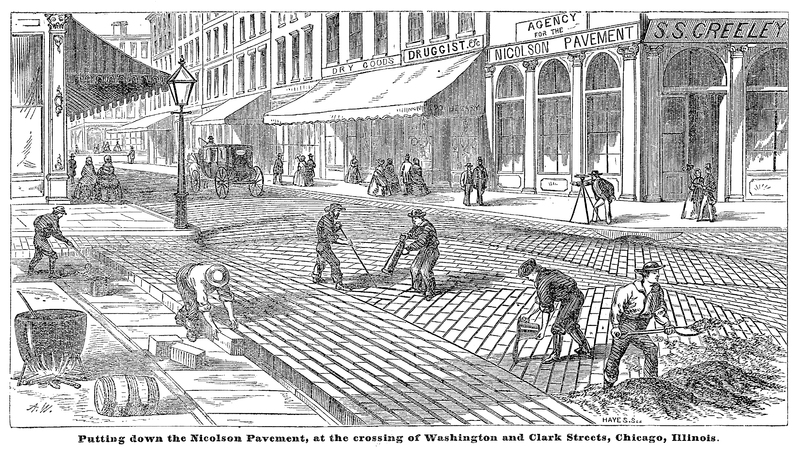 From the preparatory harvesting and transporting of materials and their shaping into usable pavements to their maintenance through the prominent efforts of street cleaning crews, human labor was the historical agent shaping the interrelationship of advancements in modes of transit and the evolution of surface pavements. 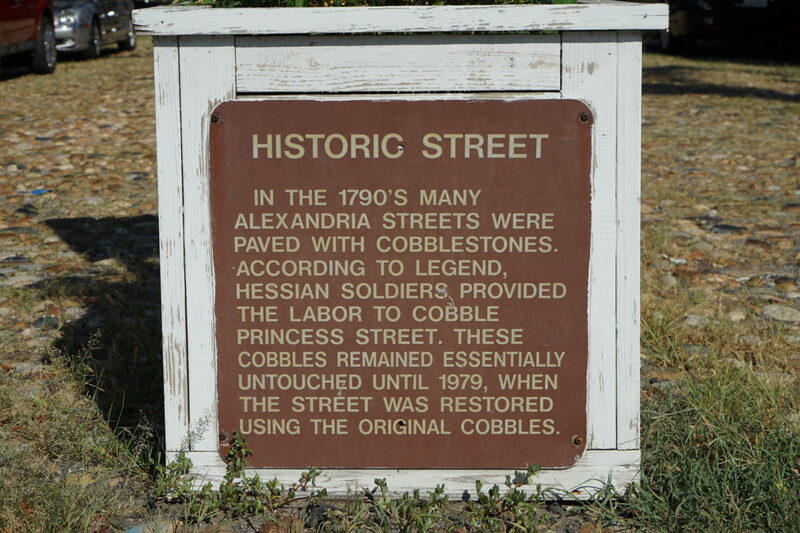 That tradition gained renewed importance with the spread of the historic preservation movement to street pavement in the 1970s, which highlighted the importance of skilled labor needed to restore historic street surfaces. Before modern synthetic sheet asphalt assumed its dominion over streets and highways in the 1920s, North American cities employed a wide array of street pavement materials. The remarkable breadth of materials was matched by the labor skills required to create and install them. 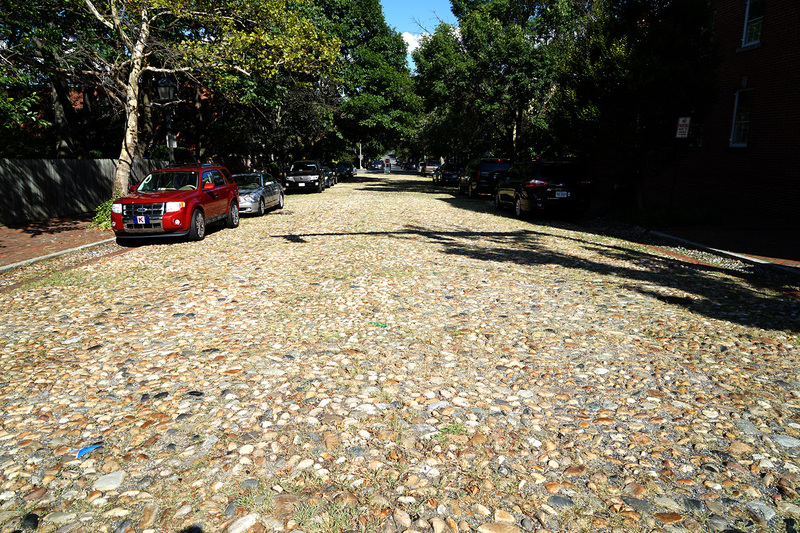 Beginning with cobblestones in New York in the seventeenth century and in Philadelphia by the early eighteenth century, most cities experimented with diverse materials beginning in the 1800s depending on their geographic location, economic resources and needs. 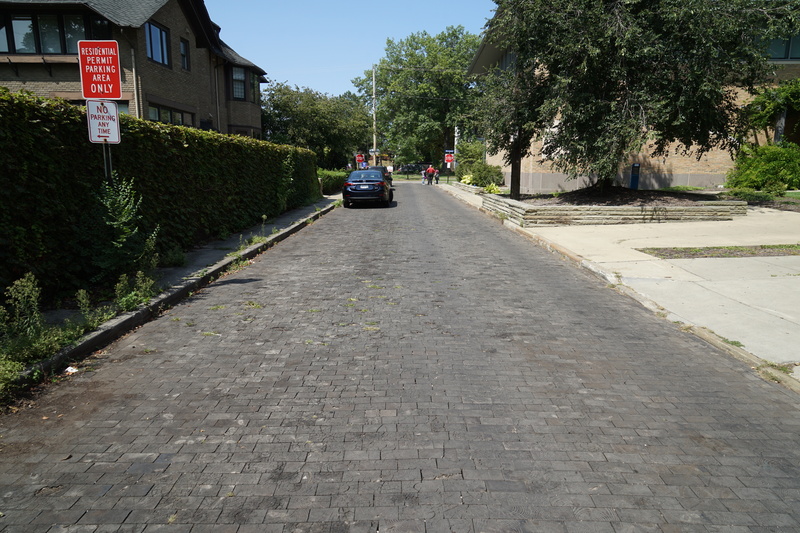 Early nineteenth-century use of macadam (a kind of layered gravel) led to midcentury experiments with wood blocks, granite or sandstone Belgian blocks, and later asphalt blocks and vitrified bricks, among others, sometimes all at the same time in the same city. Figure 1. Cobblestone pavement, Princess Street, Alexandria, Virginia, 2016. Photo by author. Figure 2. Interpretative signage about cobblestone pavement, Princess Street, Alexandria, Virginia, 2016. Photo by author. Achieving road surfaces better suited to the growing number of wheeled vehicles in industrial cities would require more skilled and intensive labor. Scottish inventor John Loudon McAdam developed a layered pavement, macadam, as it came to be known, that involved workers breaking stones to a consistent size able to be passed through a two-inch ring (figure 3). The rule of thumb for laborers was that no rock should be too large to fit into their mouth. Constructing the roadbed itself was equally labor intensive, with a layer of broken stone followed by a binder layer of some kind, such as sand, lime or bitumen, then compacted with a roller. Some macadam roads involved multiple such layers. First used in London in 1820 and in the United States by 1823, macadam enjoyed extensive use throughout the nineteenth century and even into the first decades of the twentieth century due to its relative affordability. It remained in 1904 the most common type of pavement in some major cities, including Boston, New York and St. Louis (figure 4). Macadam, however, was far from permanent and prompted complaints about dust. In response, municipal engineers in each city experimented after 1850 with more expensive block, brick and cylinder pavements of wood, stone, asphalt and fired clay to solve the pavement problem. Figure 3. 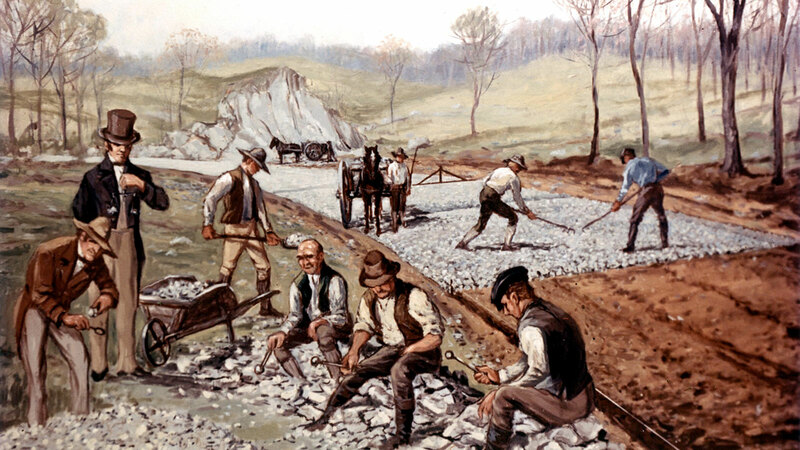 Carl Rakeman, “First American Macadam Road,” 1823, depicting workers constructing the Boonsborough Turnpike Road between Hagerstown and Boonsboro, Maryland. Courtesy of the Federal Highway Administration. Figure 4. 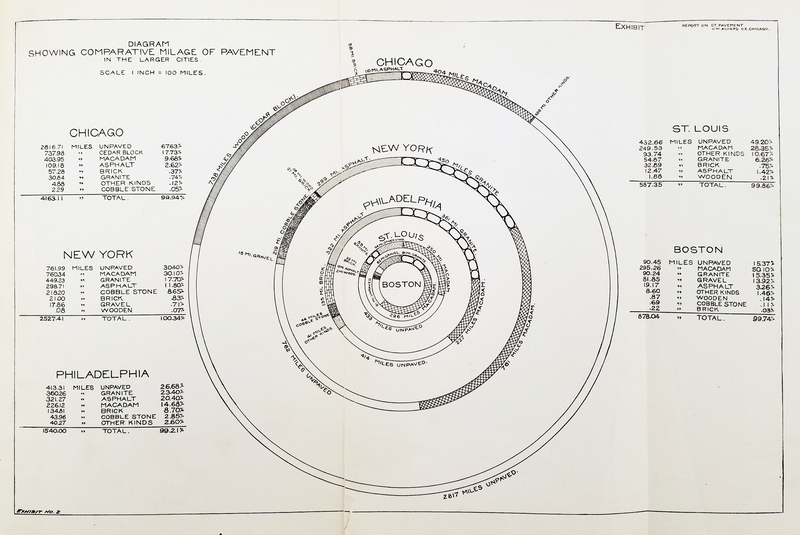 Diagram showing relative proportions of different types of street pavement used in major American cities in 1904. Source: John W. Alvord, “A Report to the Street Paving Committee of the Commercial Club on The Street Paving Problem of Chicago” [Chicago: R. R. Donnelley & Sons Company, Printers, 1904], exhibit no. 2). Perhaps because of the relative ease with which it can be shaped and its availability in many regions across North America, wood enjoyed early widespread use as a pavement material beginning in the 1830s. 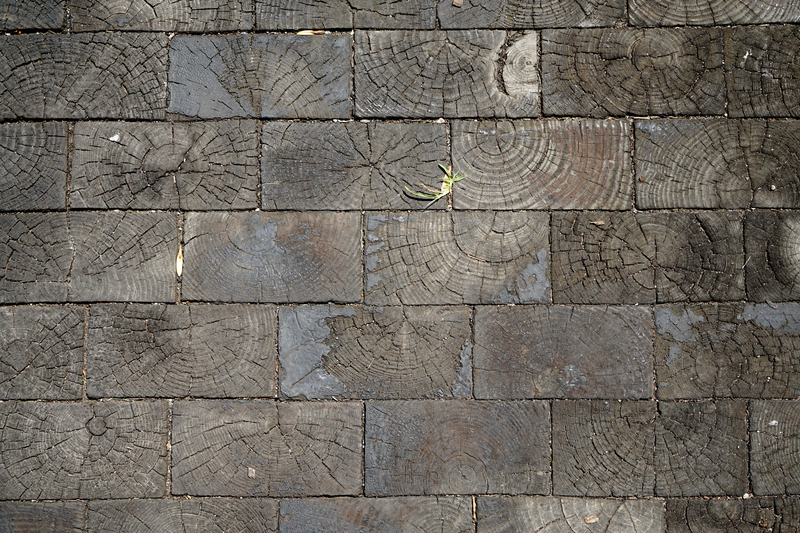 Whether cut into planks or rectangular or hexagonal blocks, wood pavements required not only the labor of loggers to fell trees and workers at saw mills, but were the first North American pavements to require the craftsmanship of carpenters or masons at the point of installation (figure 5). The use of wood cylinders, such as those in Detroit (figure 6), simplified the shaping process, but necessitated careful sorting and placement of pieces of differing diameters to minimize the spaces between them. Wood pavements were smooth, affordable and “noiseless,” but struggled, however, with durability, even when later coated in creosote (figures 7 and 8), which limited their use in most cities to streets with relatively light vehicular traffic or where reducing noise was essential, such as by court houses. Figure 5. Workers laying Nicolson wood blocks in Chicago. Source: “The Nicolson Pavement, Invented by Samuel Nicolson,” 1859. Figure 6. “Cedar block resurfacing gang” installing wood cylinders in Detroit. Source: “Twenty-Eighth Annual Report of the Board of Public Works of the City of Detroit, 1901-1902,” in Annual Reports of the Several Municipal Commissions, Boards and Officers of the City of Detroit, for the Year 1901-1902 (Detroit: The Richmond & Backus Company, 1903), opposite page 40. Figure 7. Wood block pavement, Hessler Court, Cleveland, 2017. Photo by author. Figure 8. Wood block pavement, Hessler Court, Cleveland, 2017. Photo by author. Rectangular Belgian blocks, usually of granite but also of sandstone in the Midwest, emerged in the mid-nineteenth century as the pavement of choice for industrial areas where heavy traffic was most common (figure 9). 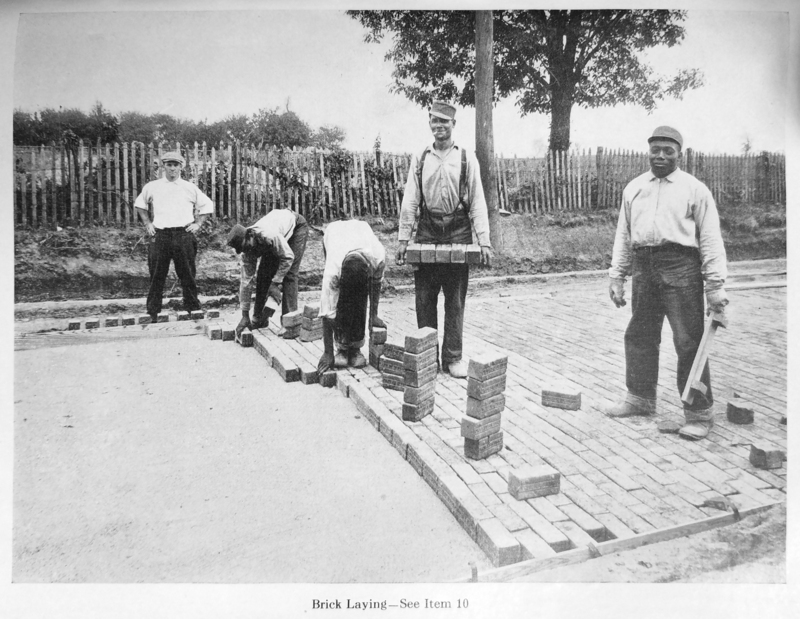 Shaped by arduous hand chiseling, Belgian blocks are generally rectangular in shape and often vary in size, reflecting the manual-labor nature of its production – as seen in the paving of The Esplanade in Toronto in 1905 (figures 10 and 11). 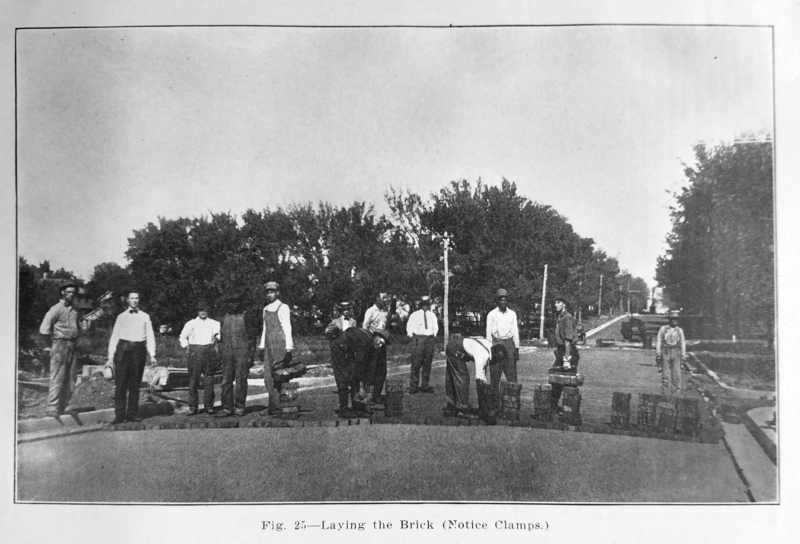 Introduced in the early 1880s, vitrified brick gradually became the most widespread and versatile pavement for both city streets and early automobile highways prior to the introduction of synthetic asphalt in the 1920s due to its combination of durability, smoothness and being waterproof (figure 12). 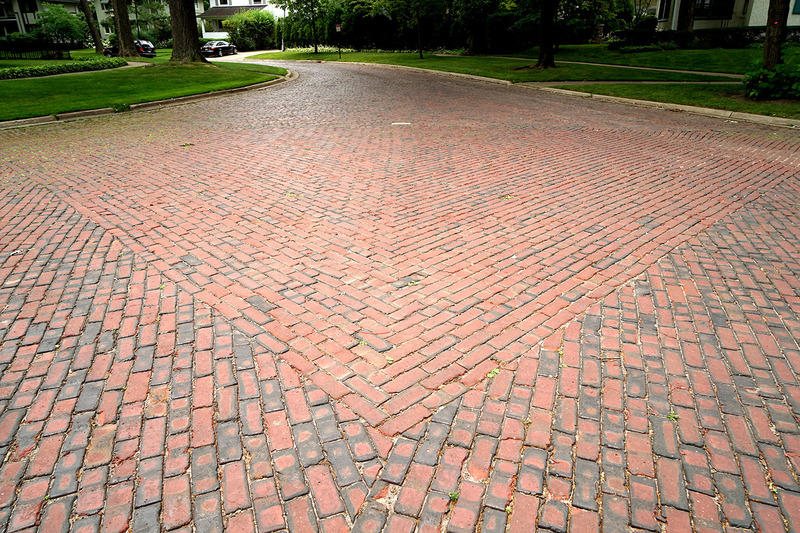 Unlike all previous pavement types, vitrified brick was industrially produced in brick-making factories, which nonetheless required extensive human labor to collect the clay, form it into molds, place the clay into and remove it from ovens and stack for shipment. Its introduction coincided with the rising popularity of bicycles, whose promoters launched the Better Roads Movement to advocate for smoother pavement, which helped spread the use of vitrified brick by the end of the century. Figure 9. Granite Belgian blocks, Thames Street, Baltimore, 2017. Photo by author. Figure 10. 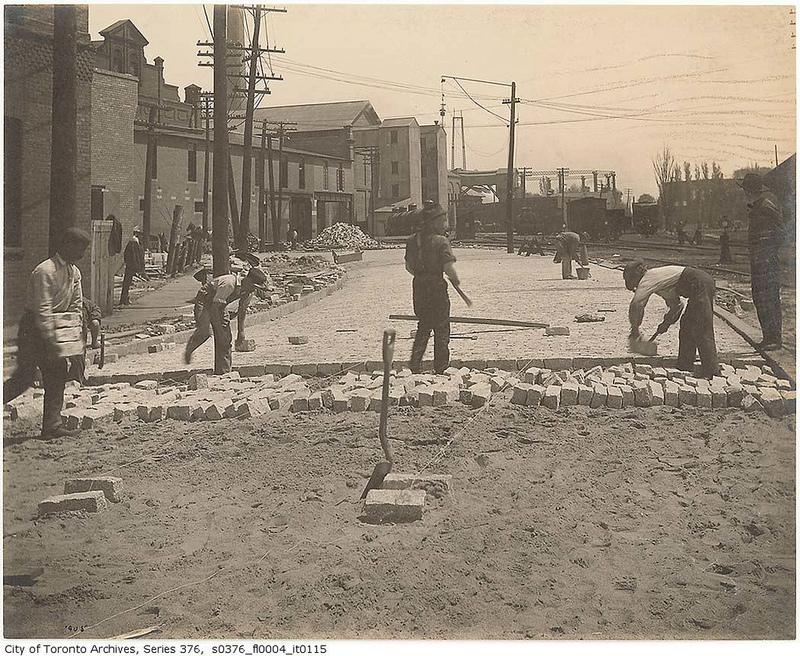 Workers installing granite Belgian block pavement on The Esplanade in Toronto, 1905. Source: City of Toronto Archives, Fonds 200, Series 376, File 4, Item 114. Figure 11. 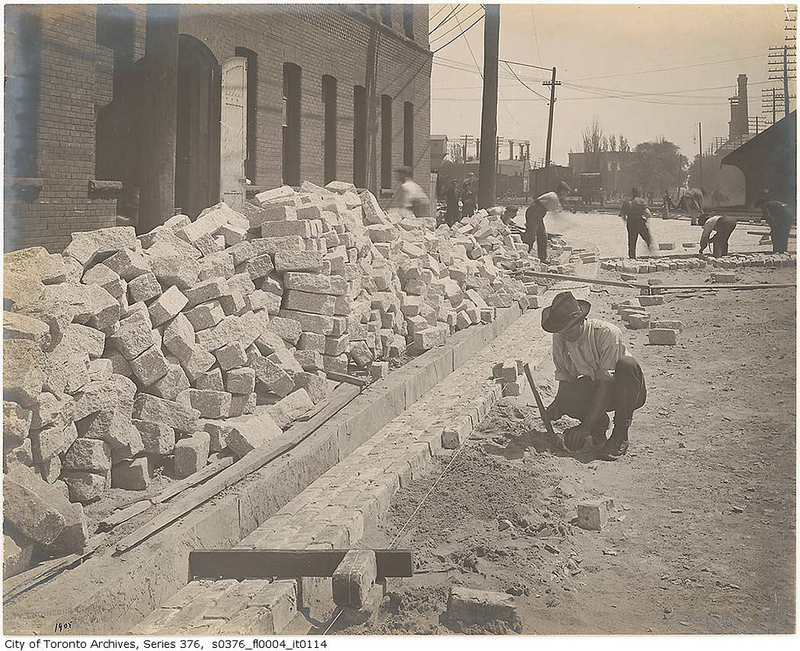 Workers installing granite Belgian block pavement on The Esplanade in Toronto, 1905. Source: City of Toronto Archives, Fonds 200, Series 376, File 4, Item 115. Figure 12. Vitrified brick pavement, intersection of Woodbine Avenue and Crescent Place, Wilmette, Illinois, 2016. Photo by author. 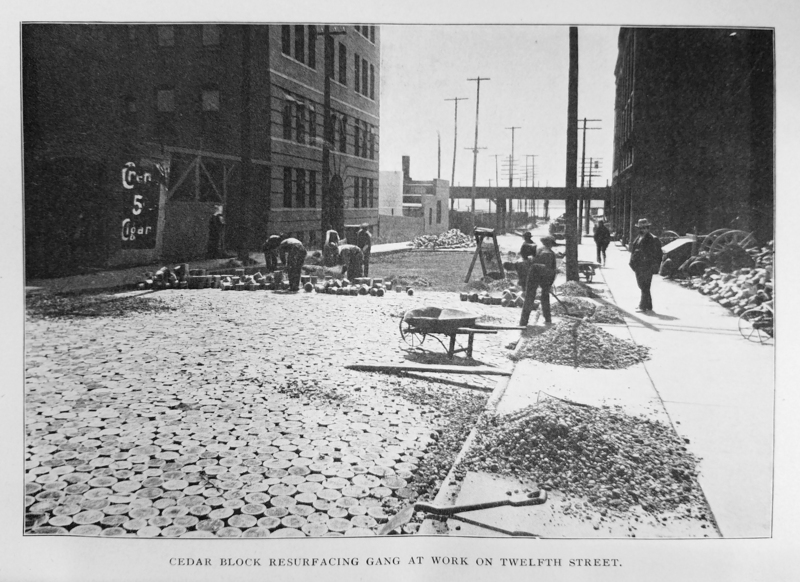 The labor-intensive work of installing block or brick pavements was the public face of the whole pavement production cycle. Municipal engineering or public works department annual reports, as well as pavement manuals, frequently included images of large crews of workers, a vivid testament to the significant financial and human investment permanent pavements represented. The ethnicity of the anonymous laborers varied, with crews of all African Americans (though usually under the supervision of a white foreman) being very common (figure 13). Yet, even in the era of Jim Crow with racial segregation, whites and blacks appear working alongside each other (figure 14). 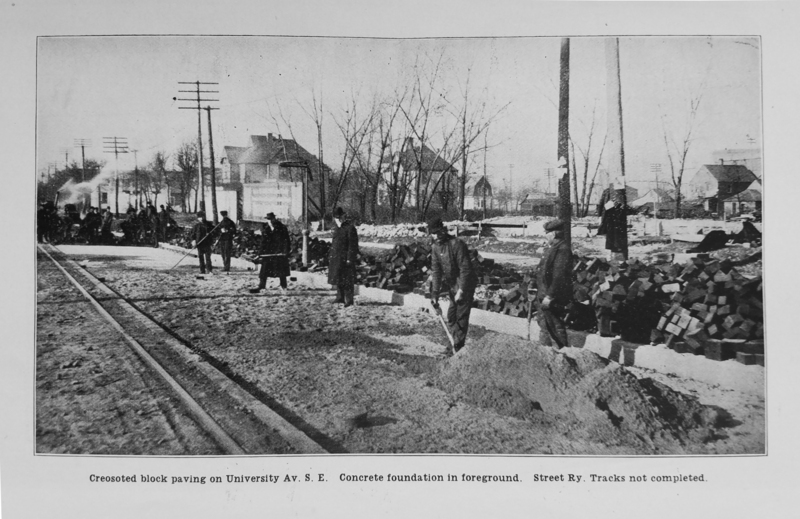 Minneapolis documented both mixed crews and all-white crews, including this 1907 view depicting workers installing pavement in decidedly cold weather, to judge by their heavy coats (figure 15). 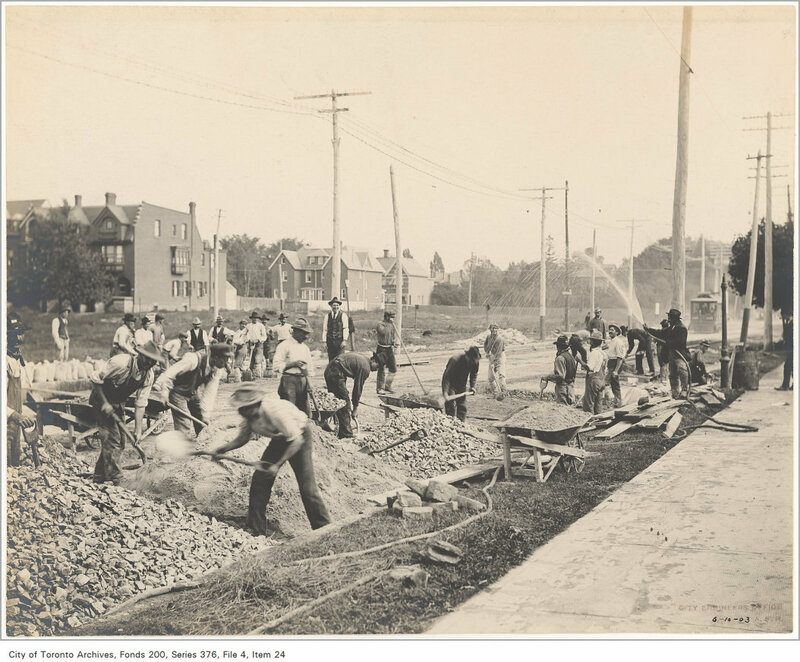 In Toronto, a range of ethnicities and an equal diversity of hat styles can be seen in the workers laying gravel pavement, likely macadam, on Bloor Street in 1903 (figure 16). Figure 13. 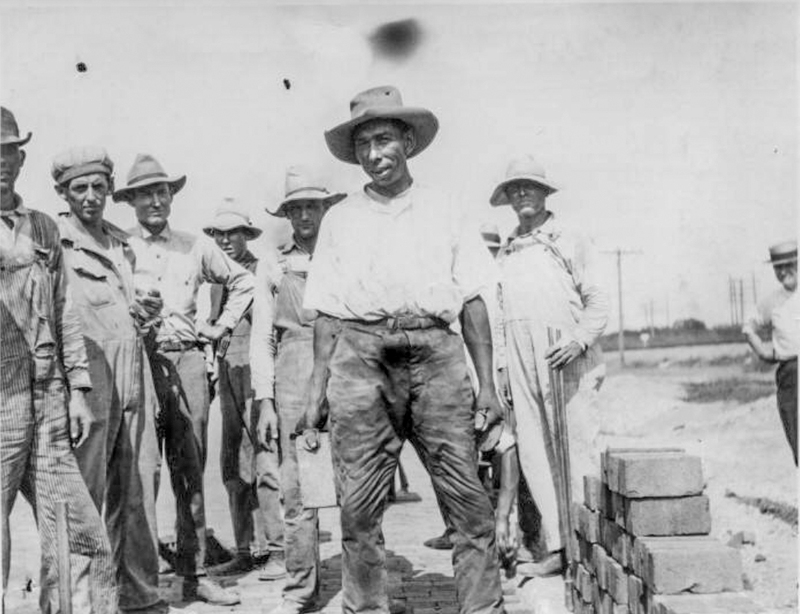 African American brick setters and their white foreman. Source: Specifications for the Construction of Vitrified Brick Street Pavements and Country Roads (Cleveland: National Paving Brick Manufacturers Association, 1916), 20. Figure 14. Crew of white and black brick setters. Source: Clarke Mandigo, A Text Book on Brick Pavements (Kansas City, Missouri: Western Paving Brick Manufacturers Association, 1917), 63. Figure 15. All-white crew of workers setting creosoted wood blocks in Minneapolis. Source: “Annual Report City Engineer, 1907,” in Annual Reports of the Various City Officers of the City of Minneapolis, Minnesota, for the year 1907 (Minneapolis: Press of Heywood Mfg. Co., 1908), 51. Figure 16. An ethnically diverse crew of road workers on Bloor Street in Toronto, 1903. Source: City of Toronto Archives, Fonds 200, Series 376, File 4, Item 24. Figure 17. 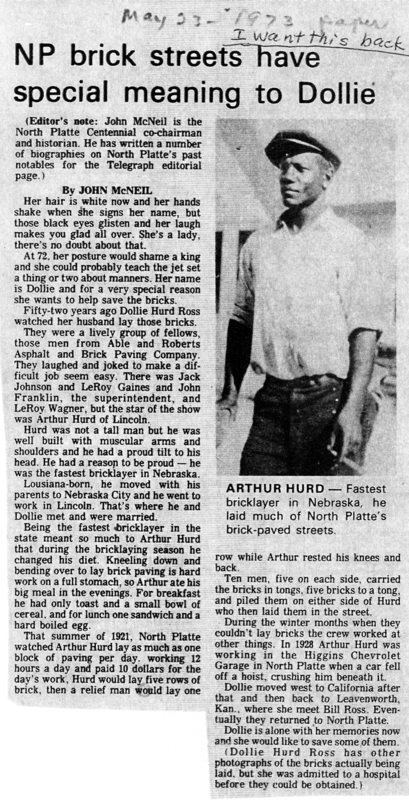 Arthur Hurd, “the fastest bricklayer in Nebraska.” Source: John McNeil, “NP Streets have special meaning to Dollie,” North Platte Telegraph, May 23, 1973. Courtesy of The North Platte Bulletin. Likely the most famous American street brick layer of all time was James Garfield Brown, more commonly known as “Indian Jim.” A Native American born in the 1880s on the Oneida Reservation in central New York state, “Indian Jim” Brown (figures 18 and 19) garnered notable press attention during his lifetime and commemoration with a marker and a documentary film after his death. Already considered a “champion bricksetter,” he participated in a head-to-head competition in Olathe, Kansas, on September 12, 1925, against Frank Hoffman of Eldorado, Kansas, to help complete the Kansas City Road. Press coverage reported that “The work of the Indian, who was a discovery of The [Kansas City] Star, was a demonstration that brick-setting may be made an art, not a drudgery. When Indian Jim stretched up from his completed task to hear the cheers of the crowd in his ears, he knew he had been working.” Indian Jim set 46,644 bricks, 1,755 more than Hoffman, in six hours and 45 minutes. According to a monument in Olathe commemorating the day’s events, Senator Charles Curtis, Kansas Governor Ben Paulen and prominent local citizens laid ceremonial bricks as well. Figure 18. 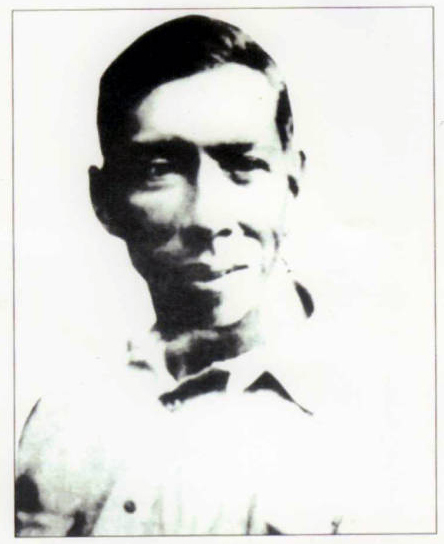 Portrait of James “Indian Jim” Garfield Brown. Source: Overland Park Historical Society, OPH-2005-009-013-1. Figure 19. “Indian Jim” and brick road workers, Kansas City-Olathe Road. Source: Overland Park Historical Society, LHS142. Figure 20. Promotional film, “A Better Illinois,” 1937, by the Federal Works Agency, Work Projects Administration, documenting the unnamed “champion brick layer of the world.” Source: Internet Archive, https://archive.org/details/ABetterIllinois1937. Figure 21. 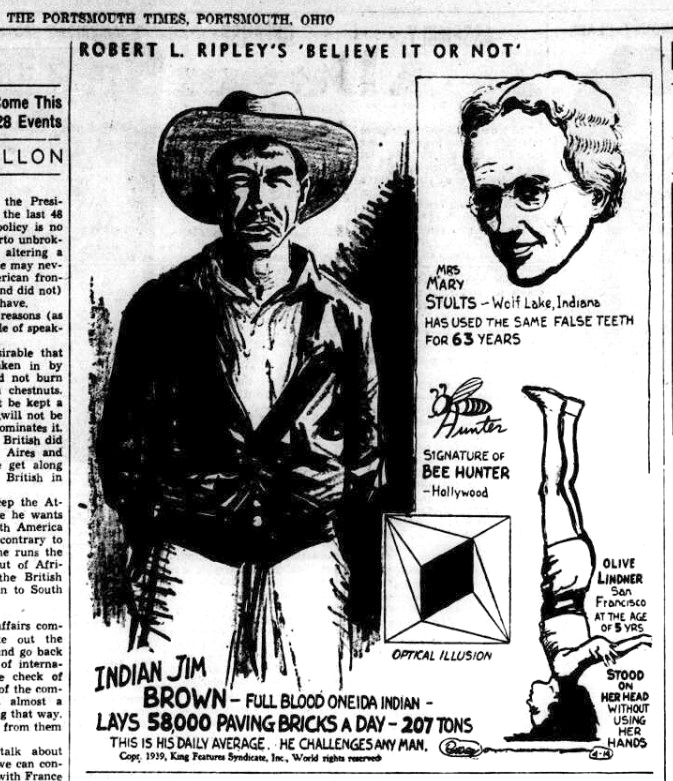 Ripley’s Believe or Not cartoon depicting “Indian Jim Brown,” appearing in The Portsmouth Times, April 14, 1939. Courtesy of the Portsmouth Daily Times. Human hands also played a critical role in keeping streets clean. New, permanent street pavements were seen as critical to the progress and health of a modern city, but so too was street cleaning. At a time when horses and other draft animals still filled the streets and regular residential garbage collection did not yet exist, trash, animal urine and excrement, and even dead animals could quickly make newly paved streets objectionable, if not a health hazard. 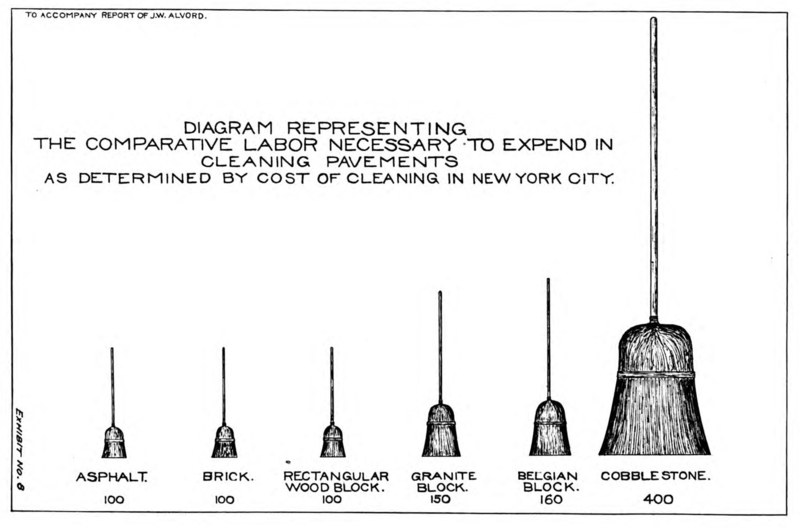 Recognition of the human labor involved in street cleaning appears in a unique graphic using broom sizes to represent the amount of labor required based on the relative cost of cleaning different kinds of pavement in New York (figure 22). 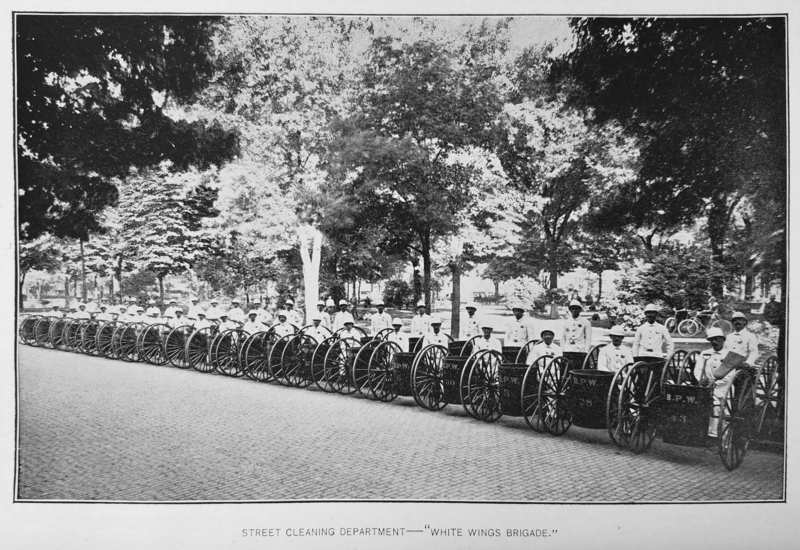 No city took greater pride in their street cleaning crews than Detroit, which introduced its highly influential “White Wings Brigade” in 1897 – a force of fifty white men dressed in white suits, each accompanied by a pushcart with a receptacle (figure 23). Leaders in the city’s Public Works department boasted that “Detroit is one of the cleanest of cities. Broad avenues of asphalt and brick and lovely residence streets of cedar block would be given scarcely a passing notice by the visitors were it not for the fact that brush and broom in the hands of expert workers make the streets as scrupulously clean as it is possible for them to be.” The idea immediately proved successful, spawning similar crews within that first year in twenty other cities. By 1902, the brigade had grown to 100 men and continued to be proudly illustrated in the pages of reports. As late as 1923, the city of Los Angeles used the same term “White Wings” to describe their street cleaning workers. Figure 22. Diagram showing relative labor involved in cleaning different types of street pavement in New York. Source: John W. Alvord, “A Report to the Street Paving Committee of the Commercial Club on The Street Paving Problem of Chicago” [Chicago: R. R. Donnelley & Sons Company, Printers, 1904], exhibit no. 8). Figure 23. “White Wings Brigade” of street cleaning workers, Detroit. Source: “Twenty-fourth Annual Report of the Board of Public Works of the City of Detroit, 1897-8,” inAnnual Reports of the Several Municipal Commissions, Boards and Officers of the City of Detroit, for the Year 1897-8 (Detroit: The Richmond & Backus Company, 1898), opposite p. 48. The arrival of synthetic asphalt in the 1920s gradually curtailed the use of bricks or blocks for new streets, and most old streets disappeared under blacktop before long. Yet, an appreciation for old, hand-made pavements helped some communities keep their old streets intact. 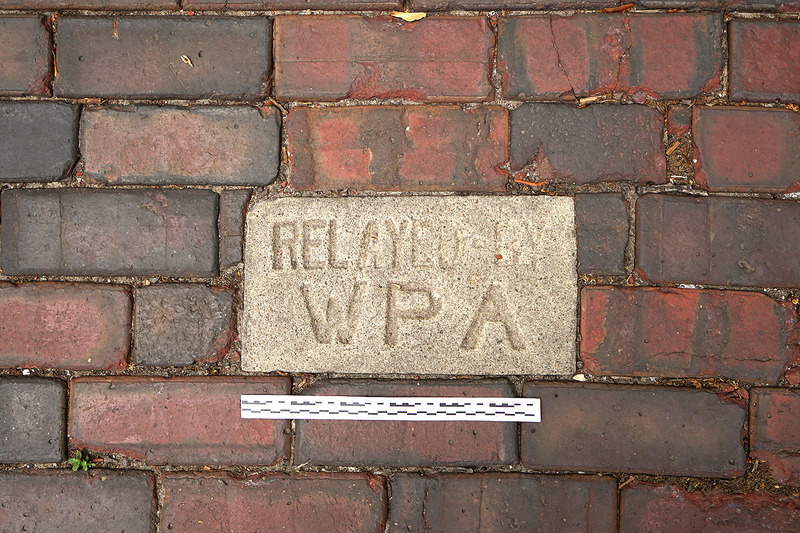 For example, streets in Wilmette, Illinois, saw their bricks “Relayed by WPA” (as noted by embedded plaques) – a potentially unique project of that Depression-era government make-work program that involved workers inverting the bricks so that their worn tops were placed face down (figures 13 and 24). One intersection involves obliquely oriented brick rows meeting at a large triangle, displaying a remarkably high level of care and attention to detail. Multiple varied iterations of similar triangular patterns exist around eight of the squares in downtown Savannah, where T-shaped intersections prompted their installation. 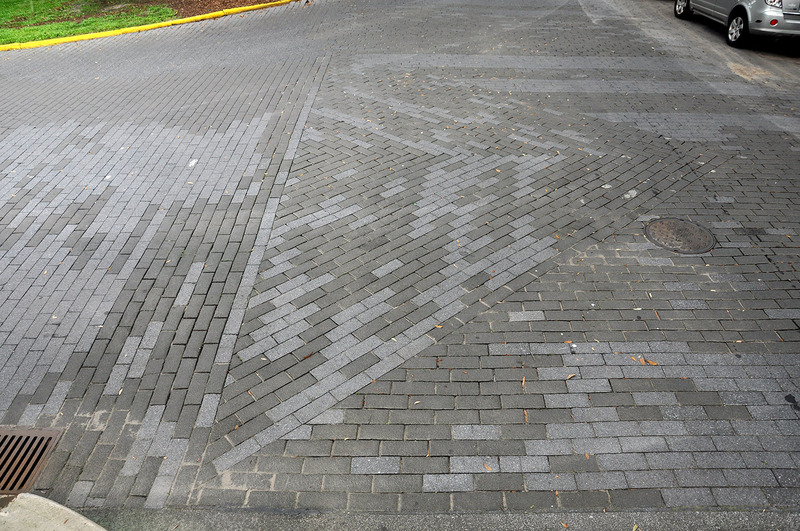 Early twentieth-century asphalt blocks – a historic paving material that survives in very few cities – form the triangles by having blocks rotated 45 degrees to keep them perpendicular to the turning wheels of two-way traffic. Although movement around the squares is now one-way only (like a round-about), the city maintains the triangles, which require careful attention to detail, as can be seen in the various shades of blocks, with the darker ones being oldest (figure 25). Figure 24. Embedded concrete plaque installed by the Works Progress Administration in the vitrified brick pavement, intersection of Woodbine Avenue and Crescent Place, Wilmette, Illinois, 2016. Photo by author. Figure 25. Asphalt blocks laid in a triangular formation and showing the insertion of lighter newer blocks, intersection of Barnard and West Gordon Streets, Savannah, Georgia, 2013. Photo by author. The rise of the historic preservation movement nationwide for buildings in the 1950s and 60s spread to pavement preservation and restoration in a few cities by the 1970s. The City of Tampa has been a leading city in protecting and maintaining its vitrified brick streets. The restoration of a small section of Morgan Street in 1974 garnered newspaper coverage, which lamented that “although brick-laying probably is a lost art by now, these men chiseled, paced and pounded the bricks with astonishing efficiency.” Like the brick layers of the 1920s, most of the workers are anonymous in such reports, but one street restoration master craftsman, Woodrow Pippin of Tampa, enjoyed a level of recognition that recalls Arthur Hurd and Indian Jim Brown. A 1978 Tampa Times article profiling Pippin characterized him “Like some whiz-bang mathematician sizing a row of five-digit figures… with the eyes of a calculating mathematician.” In Philadelphia, the National Park Service’s restoration of cobblestone pavement on Library Street in the 1970s as part of the Independence Mall project evidently privileged craftsmanship over authenticity, with large pavement stones neatly arranged down the middle of the roadway and much smaller stones laid in elegant sets of arcs along the sides (figure 26), rather than the random irregularity of historic cobblestone pavement, as in Alexandria. 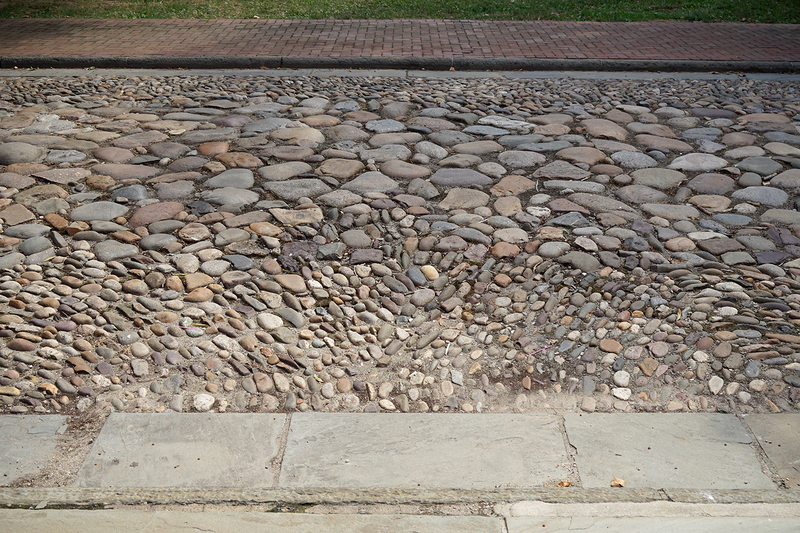 Figure 26.Reconstructed cobblestone pavement, Library Street, Philadelphia, 2016. Photo by author. 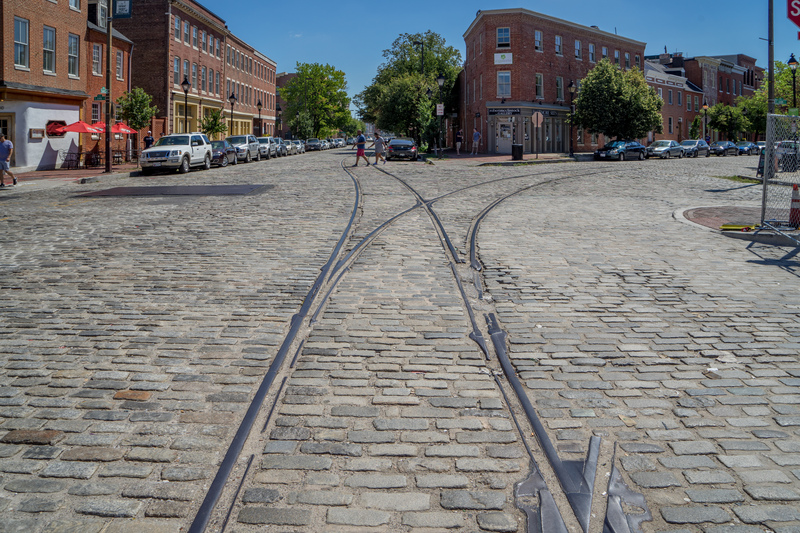 As more cities consider restoring brick and block streets, skilled craftsmen and supportive crews of laborers will be needed once again, a vivid reminder of the central role manual labor has played in the creation of our transportation networks. Regarding New York, see Niko Koppel, “Restoring New York Streets to Their Bumpier Pasts,” The New York Times (July 18, 2010); regarding Philadelphia, see “Historic Street Paving Thematic District” nomination form, Philadelphia Register of Historic Places, 1998, Description section, page 2, accessed June 10, 2018, from https://www.phila.gov/historical/PDF/Historic%20Paving%20Thematic%20District.pdf. W. M. Gillespie, A manual of the principles and practice of road-making: comprising the location, construction, and improvement of roads (common, macadam, paved, plank, etc. ); and railroads (New York: A.S. Barnes & Co., 1848), 216-17. “1823 – First American Macadam Road,” The Paintings of Carl Rakeman, U.S. Department of Transportation, Federal Highway Administration. Accessed April 25, 2018 from http://www.fhwa.dot.gov/rakeman/1823.htm. John W. Alvord, “A Report to the Street Paving Committee of the Commercial Club on The Street Paving Problem of Chicago” (Chicago: R. R. Donnelley & Sons Company, Printers, 1904), exhibit no. 2. Macadam represented 50.1, 30.1 and 28.35 percent of all street surfaces in Boston, New York and St. Louis, respectively. Daily Morning News [Savannah], October 25, 1859, p.2, col. 1. An early use of this term is “A Noiseless Pavement,” Daily Alta California (September 16, 1876), 1. “Downtown streets were paved by ‘fastest bricklayer in the state’,” North Platte Bulletin (Oct. 29, 2010), posted on the Save the Bricks in Downtown North Platte website. Accessed online: http://www.savethebricks.com/2010/11/17/downtown-streets-were-paved-by-fastest-bricklayer-in-the-state/. John McNeil, “NP brick streets have special meaning to Dollie,” North Platte Telegraph (May 23, 1973). “Olathe Celebrated a New Brick Road Saturday—and `Indian Jim’ Wins,” The Olathe Mirror (September 17, 1925), 5, reprinted in Pat Davis, “’Indian Jim’s’ victory recalled as K.C. brick road is removed,” The Daily News [Olathe, KS] (October 22, 1971), 6A. Mike Cox, Texas Panhandle Tales (History Press Library Editions, 2012). For information on the marker, see The Historical Marker Database, https://www.hmdb.org/marker.asp?marker=20270. The almost two-minute short film can be viewed online: https://www.youtube.com/watch?v=wyLWNlMXDEU. See also “Olathe Film Series,” Kansas City Area Historic Trains Association website, https://www.kcahta.org/our-history-1/olathe-film-series/. “Twenty-fourth Annual Report of the Board of Public Works of the City of Detroit, 1897-8,” in Annual Reports of the Several Municipal Commissions, Boards and Officers of the City of Detroit, for the Year 1897-8 (Detroit: The Richmond & Backus Company, 1898), 48 (Detroit Public Library). “Twenty-Eighth Annual Report of the Board of Public Works of the City of Detroit, 1901-1902,” in Annual Reports of the Several Municipal Commissions, Boards and Officers of the City of Detroit, for the Year 1901-1902 (Detroit: The Richmond & Backus Company, 1903), 60 and accompanying image between pages 57 and 59 (Detroit Public Library). John Griffen, “Annual Report of the Engineering Department of the City of Los Angeles, July 1st, 1922, to June 30th, 1923,” 19 (City Archives and Record Center, Los Angeles). “Streets of Brick,” The Tampa Tribune (August 16, 1974), 6-Metro. Copy in the “Tampa-Streets / (1800’s – 1970’s)” vertical file, Special Collections, Tampa Public Library. Dale Wilson, “Brick laying doesn’t put them on easy street,” The Tampa Times (June 5, 1978), section B Copy in the “Tampa-Streets / (1800’s – 1970’s)” vertical file, Special Collections, Tampa Public Library. Robin B. Williams, Ph.D., chairs the Architectural History department at the Savannah College of Art and Design. His research focuses on the history of modern architecture and cities, currently focusing on the evolution of street and sidewalk pavement in North America. He is the lead author of Buildings of Savannah (University of Virginia Press, 2016), the inaugural city guide in the Society of Architectural Historians’ Buildings of the United States series. Return to People-Works: The Labor of Transport.